Lucknow: Lucknow Metro Rail Corporation‘s (LMRC) principal advisor E Sreedharanon Tuesday advised the Metro officials to implement austerity measures to control the expenses on maintenance and operations as the project is yet to start making profit. Dr. E. Sreedharan, Principal Advisor, LMRC, visited Lucknow Metro and reviewed the progress of the project for the entire 23 km long North –South Corridor (Phase 1A) from Chaudhary Charan Singh Airport to Munshipulia. Shri Kumar Keshav, Managing Director and other Directors accompanied him throughout his visit and briefed him about the progress of this prestigious Metro project. During his visit, Sreedharan also reviewed the progress of 23km-long North – South Corridor (Phase 1A) from Chaudhary Charan Singh Airport to Munshipulia. 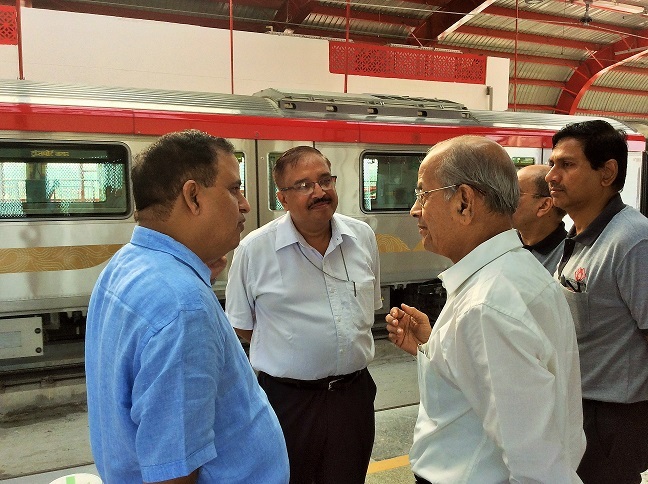 Kumar Keshav, the managing director of the LMRC and other officials accompanied Sreedharan during the inspection and briefed him about the progress of the Lucknow Metro project. Sreedharan first visited the Transport Nagar Metro station where Kumar Keshav briefed him the operational and passenger facilities provided by the LMRC. The ‘Metroman’ also visited the concourse and platform of the station to inspect the state-of-the-art facilities. Sreedharan later took a ride in a Metro train from Transport Nagar to Charbagh and expressed satisfaction on the cleanliness maintained at the station and train coaches. “He praised Kumar Keshav and his team for maintaining top-class standards at the station and inside the train”, said an official. Sreedharan also visited LMRC’s administrative office where officials apprised him about the progress of the underground Metro work on the Hussainganj-Sachivalaya-Hazratganj section and the elevated section beyond KD Singh Babu to Munshipulia. Sreedharan also discussed the progress of other proposed projects in Varanasi, Kanpur and Gorakhpur.